← How to convert Office to flash by online application? Question:I need to add some extra text to an existing PDF, what is the best way to go about this and what extra software will I need to install.Note: Ideally I would like to be able to run this on both Windows and Linux, but at a push Linux only will do. Is there any solution on VeryPDF? Answer: According to your needs, I guess maybe you can have a free trial of this software: VeryPDF Annotator Cloud API. This is online tool, which allows you to add text to existing PDF. And as this is cloud based application, it can work under all the computer system including Windows and Linux. Please check more information of this software on homepage, in the following part, let us check how to use this software. When you use this software, you do not need to download any software or application. Simply open this URL in website then you can add text to PDF. The following snapshot is from the website, please have a check. All the steps have been marked clearly on website. Please upload PDF file which you need to add text to PDF. You can either upload online file or local PDF file. If you have API code, please input there, If you do not have, this steps could be ignored. Then click button Annotate Now, then you can enter another website page. Step 2. Add text to PDF by this online tool. The following snapshot is from the output website, please have a check. Here you can add text to PDF easily. The PDF you have uploaded will be shown here. There is a button Named Text, click it then you can add text to PDF. There are four text colors for you to choose. And here you can also choose the font size. You can also use the printing method to add text to PDF. 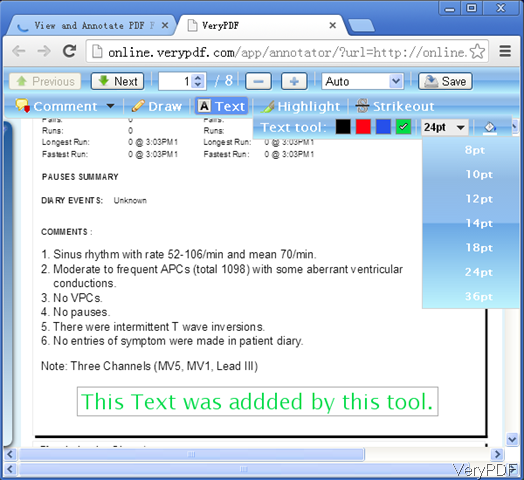 In the above example, I have added some text “This text was added by this tool”. You can have a check. Meanwhile here you can also add comments to PDF, draw lines, circles to PDF, highlight text to PDF and strikeout the font in PDF. If you have finished adding text to PDF, please click button Save to save it as a new PDF file. There is no PDF output directly.There will be output and URL, you need to download it. By this tool and this method, you can add text to the existing PDF either under Windows or Linux easily. During the using, if you have any question, please contact us as soon as possible. This entry was posted in VeryPDF Cloud API and tagged add text to PDF. Bookmark the permalink.